In my posts before, I have already discussed how to start a podcast and also about the podcasting plugins. Hence, I surmise I don’t have to talk much about podcasting, or its benefits in this article over again. So, let me jump right away into the WordPress Podcast Themes in this article. Like I always say, WordPress has rained down upon us its wide range of best WordPress themes. However, when it comes to WordPress Podcast Theme, the number is quite limited. And among them, I have handpicked some of the best ones that perfectly fits in your all kinds of podcasting requirements. True to its name, Podcaster happens to be the number one choice when it comes to creating a podcasting site. 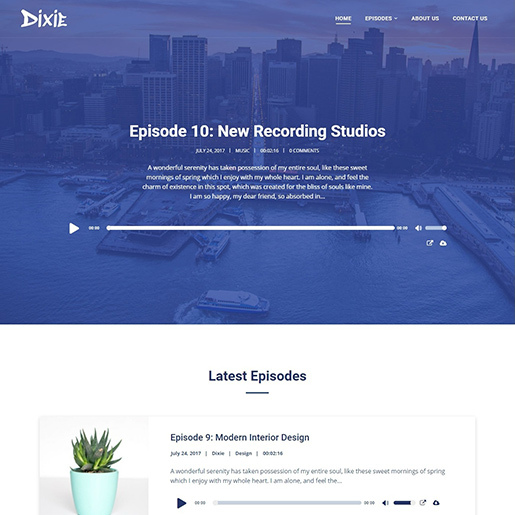 It is a clean, ultra-flexible and fully responsive WordPress Podcast theme which supports both audio and video formats including oEmbed. Furthermore, it also allows you to display your featured podcast entries on your front page. Besides, it also offers you two kinds of templates to choose from Dark and Light. Parallax scrolling, in addition, provides the opportunity to create that first impression among your visitors. Moreover, this theme is retina ready and also optimized for popular podcast plugins like BluBrry PowerPress and Seriously Simple Podcasting. 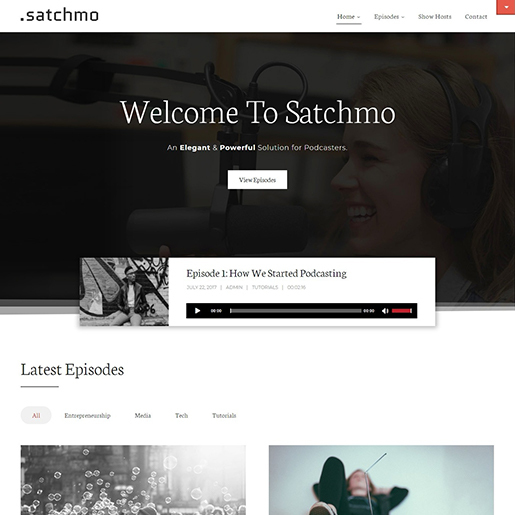 Satchmo is the latest WordPress Podcast theme developed by SecondLineThemes. It is beautifully crafted keeping in mind all such possible features that shall be required by the podcaster. Satchmo is one of those themes in which developers have put in lots of efforts in both its design and functionalities. This theme offers you plenty of theme options and is very easy to customize. 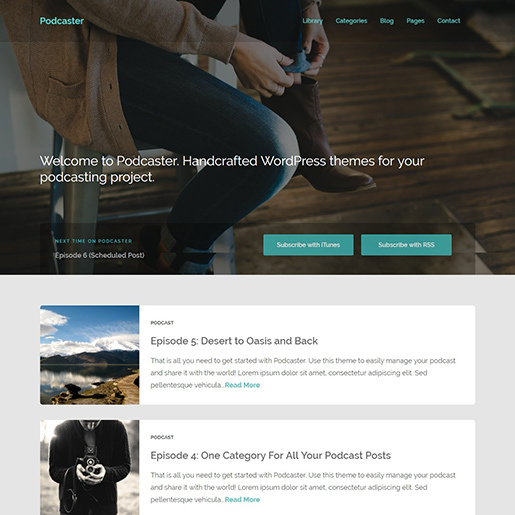 Thus, you can give your touch to this theme to create a Podcasting website as you please. Moreover, it is also optimized for both page speed and SEO. Hence, with this theme, you need not worry about the performance. In addition to that, it is also translation ready and supports many popular podcasting plugins. It also supports locally hosted or external MP3 files including embed like YouTube, SoundCloud and more. If you are thinking of starting your own radio station website, I bet there isn’t an any better option than OnAir2. This theme provides you with all that you require for creating a professional radio station website. OnAir2 is one of those podcast themes that supports all the latest podcasting technologies available. And thus, undoubtedly, it makes your website stand out by all means. Moreover, it integrates the popular page builders, Tuneln app icons as well as events carousel. Besides that, other notable features of this theme are 11 custom post types, 7 custom widgets, and 14 custom Shortcodes, events calendar and Podcast post types. 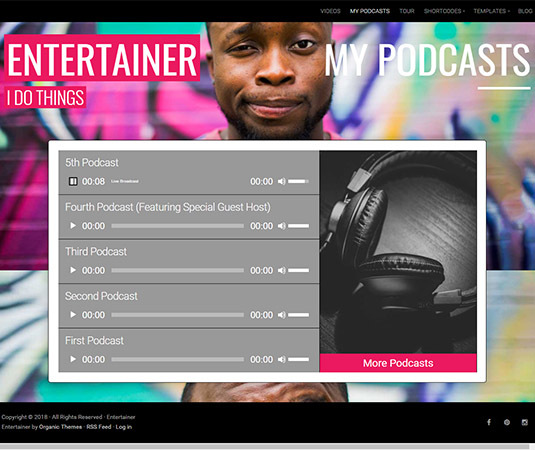 Another on our list of WordPress Podcast themes is Entertainer. 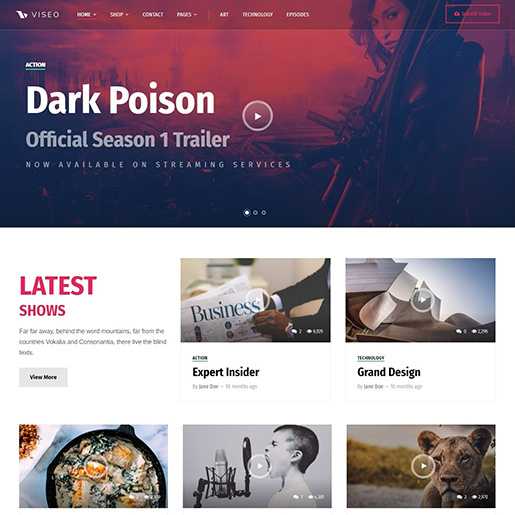 It is a beautifully designed podcast WordPress theme specifically for entertainment. Regardless of the topic and the niche of your podcast, Entertainer is the perfect WordPress Podcast theme to showcase your talent. It also embeds the Video and audio collection template that allows you to put the YouTube videos, podcasts or music samples at a display. Not just that, it also consists of the templates for blog, portfolio, tour dates and upcoming shows. Moreover, this theme works perfectly with WooCommerce, Gravity Forms, and JetPack plugins. 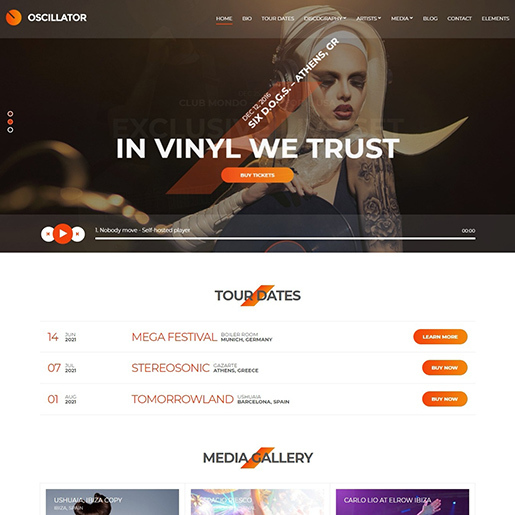 Oscillator is yet another excellent WordPress theme for Podcasters. It is a uniquely designed theme with cutting-edge functionalities. Streaming Audio Player is just the icing on the cake. Your visitors can listen to your live station or they can just download your music through the theme’s tracklisting system. And beyond that you also have an option to chose one of the best and advanced page builders – Elementor, Divi Builder, and SiteOrigin Page Builder. Moreover, it includes six post types and custom widgets. With this theme, you can build your homepage by simply using its drag and drop features. Thus, you do not need to be a tech wizard to build you podcasting website. 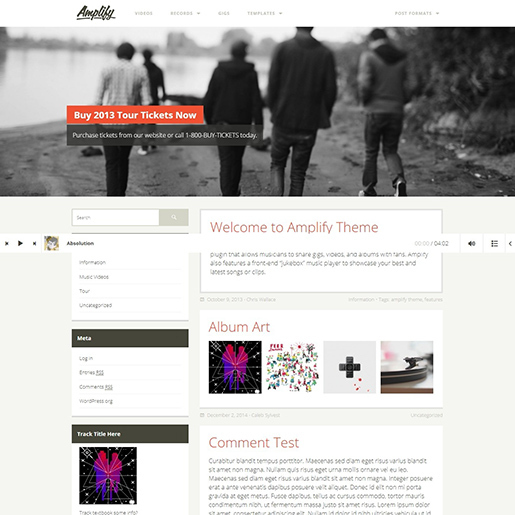 Another we have is the latest theme by SecondLineThemes. Dixie is one of the responsive WordPress themes that is very minimal in designs yet its functionalities are on point. It comes with full support for drag and drops page builder by Elementor and one-click demo installation and popular podcasting plugins. Elementor makes creating a WordPress podcasting site a breeze. On top of that, it also allows you to see the changes in the real time. Moreover, it consists of multiple layout choices, fully features Audio player, unlimited color schemes, podcast host pages and many other awesome features. Another on the list we have is Music. 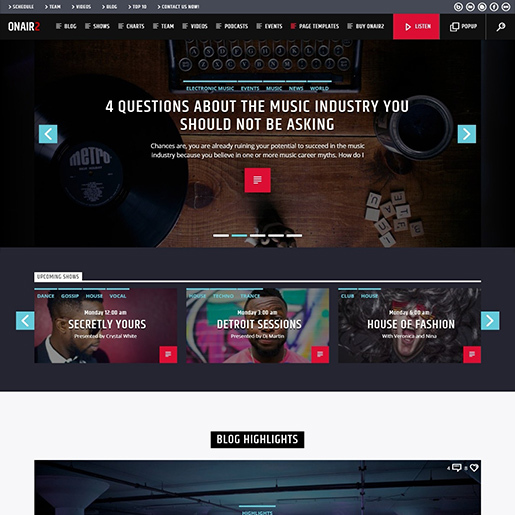 Music is a fully responsive, retina ready WordPress Podcast theme. The most awe-inspiring feature of this theme is that you can either make you single page website or opt for the multi-page design. Music theme leaves the choice all up to you. On top of that, it comes with fullwidth video backgrounds that allows you to upload your own videos on the landing sections or pages. It includes custom post types like Album, Event, Gallery, press, and Video. Thus, Music makes it super easy for embedding a custom playlist on your website. 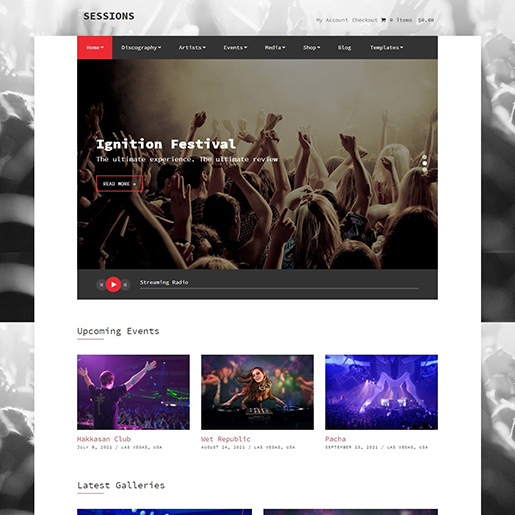 Also, you can get your visitors informed about your upcoming tours, concerts and all events including its location, venue and time without much hard work. Unlimited Layouts and Smart Layout Options. Viseo is yet another podcast WordPress theme by Progression themes that help you to take your WordPress Podcasting website to a next level. This theme also use the drag and drop page builder. Thus, even people with minimal or no coding skills can easily create an outstanding WordPress podcasting Website with Viseo. Moreover, it includes a stunning slider on the homepage along with a play button. Besides, you can also display your latest posts including text, audio or video right below the homepage slider. Since it is integrated with Elementor, creating any custom page layout is a breeze. Sessions is an elegant WordPress Podcast theme that comes along with the exquisite features and options. It consists of the slider option that allows you to put your latest episodes in the forefront making it the center of attraction. Not just that, you can also let your visitors know about your upcoming episodes. Moreover, you can also integrate a store/ shop on your theme as sell you podcast easily. Also, it is WooCommerce compatible. Besides, it consists of 6 post types and custom widgets. With this theme, you can select your favorite page builders among the most popular and best ones. The option includes Elementor, The Divi Builder, and SiteOrigin Page Builder. Last but not the least, we have Amplify. Like its name, this podcast website template is sure to amplify your brand presence. Its beautiful design, cutting-edge features along with the integration with AudioTheme plugin makes it the ultimate choice for the musicians and podcasters. 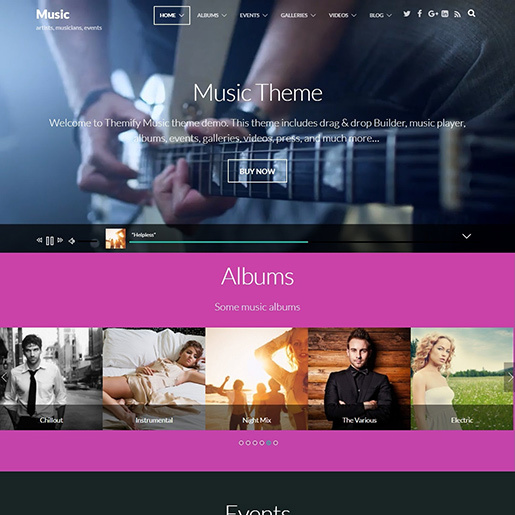 AudioTheme makes it easier for the music websites owner to manage all the gigs, discography as well as videos. Moreover, this theme supports Beaver Builder and is developer friendly. Besides, it is designed mobile first, thus, it looks good on all sort of devices and on all browsers. Some other notable features of this theme are multiple color schemes and layout options, navigation menus, and custom backgrounds. All things said these WordPress podcast themes make creating a podcast website absolutely no-brainer. These themes make very easy for you to host and promote your podcast about any subject matter. Their elegant design and outstanding features like audio players and download options make them the perfect fit for podcasting. I hope you can now start your podcasting website as all these themes take a promising take on the podcasting themes. ← WordPress Support & Help: Everything You Should Know – ThemeGrill Customer Support Explained!